WE WILL NOT SHIP SILENCERS OR COMPONENTS TO ANY ADDRESS IN THE USA (including ALL USA territories & dependencies) OR CANADA. Silencers are covered by the VCR Act and can only be posted to UK customers if the customer sends us his old silencer first, this is classed as a repair. We can ship silencers to Registered Firearms Dealers for customers to collect in person, be aware that some RFD's may charge you for this service. International customers please order as normal. Airgun silencers in the UK do not require any form of license, however, any silencer intended for use with a firearm is subject to the control of the Firearms Acts and MUST be covered by an appropriate certificate. Ultra Silencer Thread cap - Black Spare screwed & knurled Ultra silencer end caps. Replace those either damaged,worn or chipped in use. Ultra Silencer Thread cap - Bright Spare screwed & knurled Ultra silencer end caps. Replace those either damaged,worn or chipped in use. Silencer coupling double male ended 1/2" UNF This blued steel coupling has both ends threaded at 1/2" UNF, allowing any Silencers to be fitted to weapons threaded with female 1/2" UNF threads. 1/2" UNF Webley Silencer adaptor. 17mm x 1.25 pitch. Eclipse, Kodiak & Patriot - Converts the 17 x 1.25mm thread on BSA Carbine barrel weights to provide a standard 1/2" UNF male thread such as found on the the BSA Goldstar. 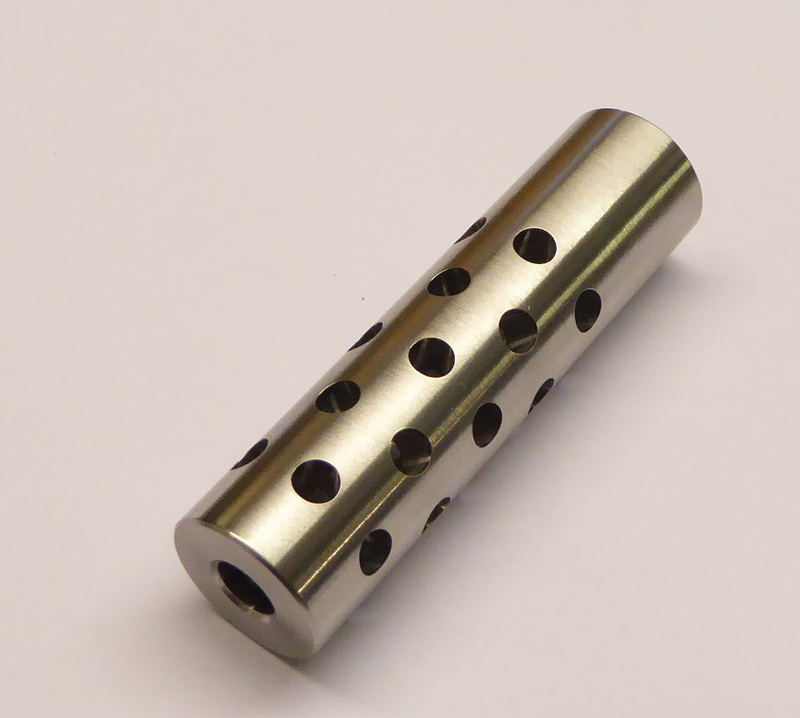 Muzzle brake for Airguns in stainless steel 1/2" unf thread. UK sales only. Parker Hale Silencer thread cap 1/2" UNF Blued steel 16mm outside diameter. 11.4mm long. Knurled finish. 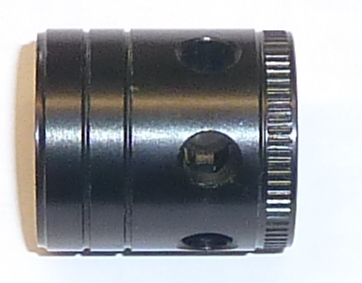 16 mm slip on foresight, with ramp, element, hood and thread protector also includes silencer adaptor. Logun CCFC Supa Airgun Silencer for Air Arms 400 Series. Push on to fit 10mm barrels. Carbon Fibre, 22cm long. Logun CCFC Supa Airgun Silencer. Push on to fit 15.5mm barrels. Carbon Fibre 26cm long. Ideal for BSA guns. Fits BSA Superten & Supersport & Lightning. Swift Stumpy airgun silencer. Baffels can be removed or added, 1/2" UNF thread, 250mm long. 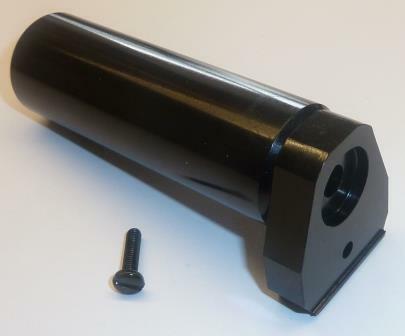 Logun/AGS Airgun silencer for PCR 1 and any other air gun that has a 10mm x 1mm thread pitch. Airgun Silencer - BSA Superten & Supersport & Lightning. Volumetric Simply slips over the .612" (15.5mm) diameter barrel. Fastened by set screw. 7.5" (190mm) long - extends barrel by 6" (150mm).Weight 6.5 oz (185g). 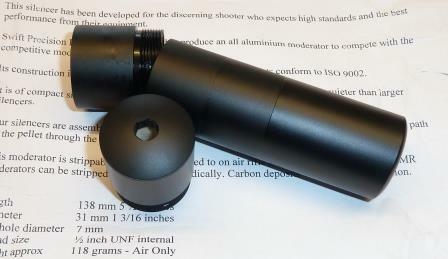 Silencer adaptor unit - BSA Hornet Converts .612" (15.5mm) barrels to 1/2" UNF thread. Fastens by an allen headed set screw and includes thread cap. Multi Fit Airgun Silencer Fits barrels from 14.3mm - 16mm in diameter. Huggett Belita Air Gun Silencer 1/2" UNF. Other threads and fittings available please contact us for avaiability. 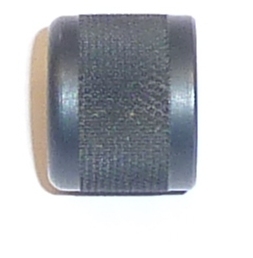 Huggett Standard Air Gun Silencer, 1/2" UNF thread. Other threads and fittings available please contact us for avaiability. 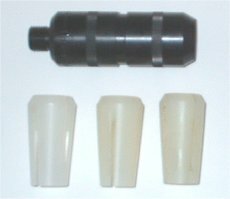 CP99 Silencer & adaptor. Screws on to the front of the gun. Thread is 1/2" UNF male on adaptor. Huggett Magna Air Gun Silencer, 1/2" UNF. SPECIAL ORDER ITEM PLEASE CONTACT US. Huggett FX400 Reflex Moderator. SPECIAL ORDER ITEM PLEASE CONTACT US. Airgun Silencer Evo (used) Some marks are evident on casing. Huggett FX 500 Reflex Moderator. SPECIAL ORDER ITEM PLEASE CONTACT US. Huggett Shroud/Standard Air Gun Silencer Combo. SPECIAL ORDER ITEM PLEASE CONTACT US. Huggett Shroud/Belita Air Gun Silencer Combo. SPECIAL ORDER ITEM PLEASE CONTACT US. 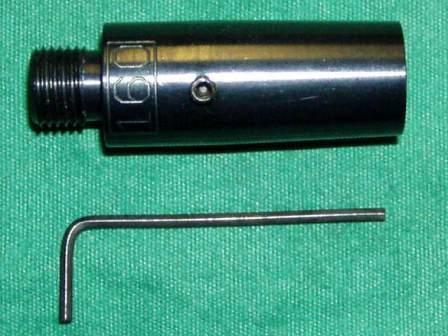 Weihrauch push on Airgun silencer for 15mm dia barrels. Fixes with grub screws. Suitable for HW30, HW35, & HW50 and air rifles with 15mm dia barrels. 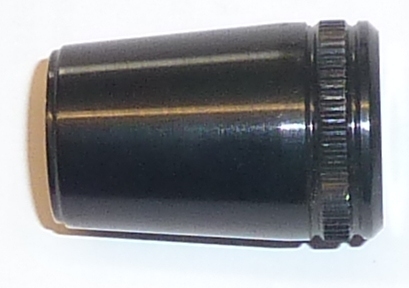 Weihrauch push on Airgun silencer for 16mm dia barrels. Fixes with grub screws, suitable for HW85 & HW80 and air rifles with 16mm dia barrels. Weihrauch push on Airgun silencer for the HW77. Slips on to the end of the barrel and is held by a fixing bracket. Armex Trueflight silencer adapter for Air Arms S400 & S410. Fits on to barrel by grub screw and gives you 1/2" UNF male thread. Will fit 10mm o/d barrels. Armex Trueflight silencer adapter for Air Arms S200 series& Air magnum. Fits on to barrel by grub screw and gives you 1/2" UNF male thread. Will fit on barrels with a Diameter of 15mm. Trueflight 11mm slip on, Rat catcher & Rabbit stopper silencer adaptor. 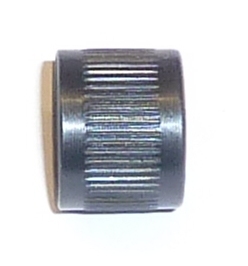 Manufactured by Armex with 1/2" UNF thread. Trueflight 15.5mm Slip on silencer adaptor. Fits BSA and allows you to use any silencer with a 1/2" UNF thread. Trueflight 16mm slip on silencer adaptor. 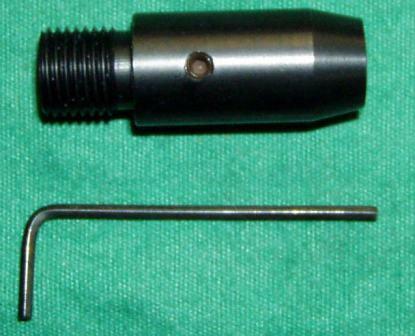 Allows you to fit any silencer with a 1/2" UNF female thread. 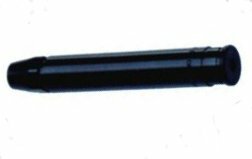 Weihrauch HW97K Airgun Silencer. Threaded to fit straight on the gun. Fits guns with serial No from 1508181. 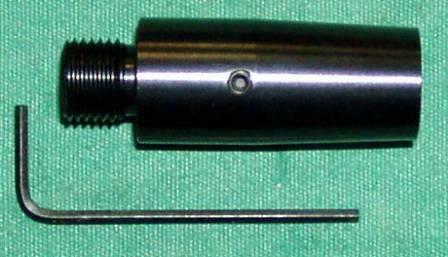 Weihrauch .25 cal (6.35mm) Air Gun Silencer, 1/2" UNF thread.